Players have long been waiting for the moment when the developers finally add stained glass to the game. If we compare the latest updates of MCPE, then we can assume that this feature will be added to Minecraft PE 1.2. Mojang is making a lot of efforts to make the Pocket Edition identical to MCPC. If you want to get sained glass right now, then download and install this mod. The modification supports Minecraft PE 1.1 and does not replace any blocks, it is very convenient. You will need a special application to install and the mod itself. 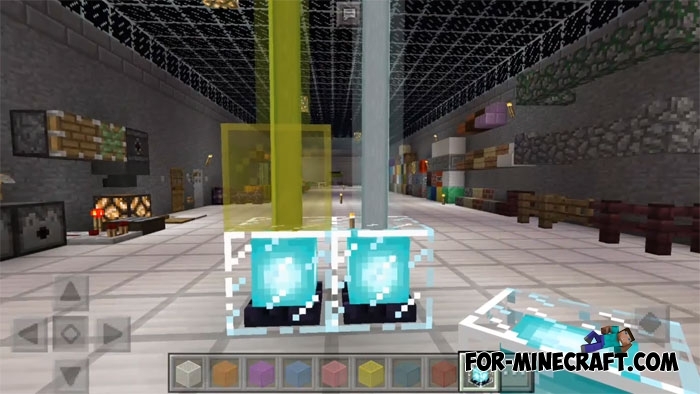 There are 13 colored blocks that can be used for decorating houses, and for creating a beacon. The finished beacon changes only the color, but not the properties depending on the color. To change the color of your beacon, you must put a stained glass of a certain color on the beacon. How to install the Stained Glass mod? Download the Modded-PE for Minecraft:PE (app) needed to install the mod. Run the Modded-PE and activate the mod. After that, you need to run the Modded-PE launcher instead of the standard game.